Climate change is now unequivocal, particularly in terms of increasing temperature, increasing CO2 concentration, widespread melting of snow and ice and rising global average sea level, while the increase in the frequency of drought is very probable but not as certain. However, climate changes are not new and some of them have had dramatic impacts, such as the appearance of leaves about 400 million years ago as a response to a drastic decrease in CO2 concentration, the birth of agriculture due to the end of the last ice age about 11 000 years ago and the collapse of civilizations due to the late Holocene droughts between 5000 and 1000 years ago. The climate changes that are occurring at present will have – and are already having – an adverse effect on food production and food quality with the poorest farmers and the poorest countries most at risk. The adverse effect is a consequence of the expected or probable increased frequency of some abiotic stresses such as heat and drought, and of the increased frequency of biotic stresses (pests and diseases). In addition, climate change is also expected to cause losses of biodiversity, mainly in more marginal environments. Plant breeding has addressed both abiotic and biotic stresses. Strategies of adaptation to climate changes may include a more accurate matching of phenology to moisture availability using photoperiod-temperature response, increased access to a suite of varieties with different duration to escape or avoid predictable occurrences of stress at critical periods in crop life cycles, improved water use efficiency and a re-emphasis on population breeding in the form of evolutionary participatory plant breeding to provide a buffer against increasing unpredictability. 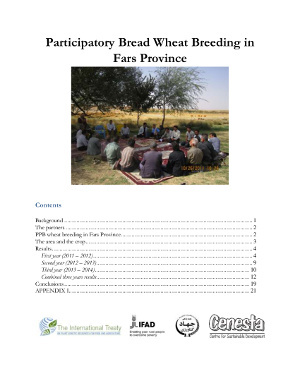 ICARDA, in collaboration with scientists in Iran, Algeria, Jordan, Eritrea and Morocco, has recently started evolutionary participatory programmes for barley and durum wheat. These measures will go hand in hand with breeding for resistance to biotic stresses and with an efficient system of variety delivery to farmers.